SEPTA police chief Thomas Nestel III (center). He's become the scourge of the Media/Elwyn Line quiet car. At 8:30 a.m., among those seeking silence on their way to work, the tall, gray-haired man is loud and insulting, other riders say. He's vocal when something annoys him, and cruel to conductors. "He's just mean and nasty, and he looks for obvious targets," said Megan Mackrides, 34, a regular rider. "The worst part is that no one feels comfortable to say, 'Hey buddy, shut up.' "
Passengers complained to police without results. In a mid-December encounter, however, the 52-year-old Springfield man's behavior reached another level, creating a delicate management problem for SEPTA. The man approached Jaclyn Spicer and her wife, who asked not to be identified, as they walked through Suburban Station to work. He called them, Spicer said, a "dynamically dykey duo." The man, through his lawyer, denied that this exchange occurred. Spicer, 38, a project manager at a software company, described it as one of her worst experiences with bigotry. "Now it's bordering on hate," she said, "and I don't trust this guy." SEPTA police took the report seriously enough to begin observation of the man, which continues even now. Public transit is a melting pot where people from beggar to banker travel shoulder to shoulder. More than 11,000 ride SEPTA's Regional Rail's Media/Elwyn Line on the average weekday; Regional Rail transports about 132,000 total people each workday. Encounters with problem passengers are nearly inevitable. "Tourists, commuters . . . there are people with different agendas and different concerns," said Joe Pantangelo, spokesman for the Port Authority of New York and NJ Transit Police. The Port Authority's PATH trains carried almost 258,000 people a weekday last year. "But the most critical part of it is using the system lawfully." That can be tricky. Some incidents are clearly criminal and lead to arrests, but transit police encounter gray areas of repeated toxic, but not criminal, behavior. SEPTA police have a playbook that recognizes the possibility of mental illness as a cause for disruptive behavior, and advocates solving problems without the use of handcuffs and citations. Spicer's experience, which left her uneasy and angry, highlights the tactics used when transit officers address problem passengers. It also makes clear the limitations of police. Despite months of police effort, passengers on the quiet car say, the man has been offensive as recently as last week. 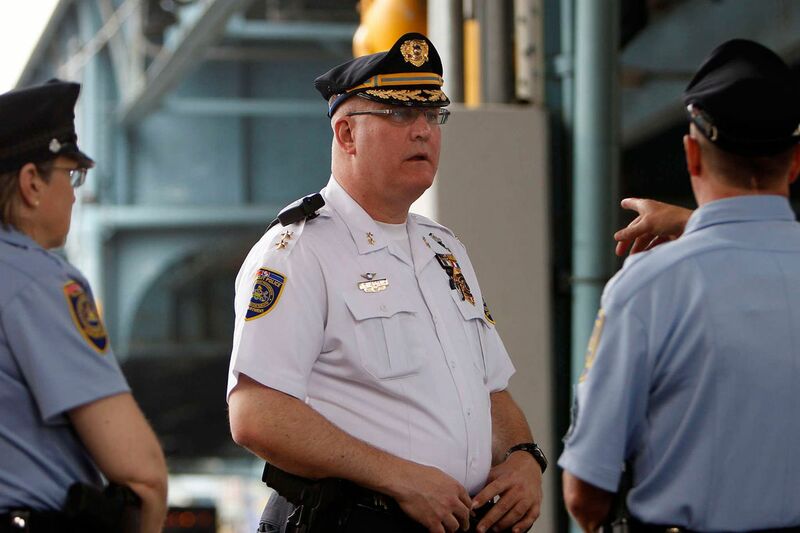 Spicer's complaint about the man - who is not being identified because SEPTA police did not charge him - wasn't the first, SEPTA Police Chief Thomas Nestel III said. SEPTA has received reports of him insulting SEPTA staff and engaging in "O.C.D.-type behavior," Nestel said, such as trying to be the first person on trains, since 2014. Obsessive-compulsive disorder causes people to have recurring thoughts and behaviors that can be uncontrollable. "Nothing that's criminal, just complaints of odd behavior would be the best way to describe it," Nestel said. One of the first questions asked in cases such as this, Nestel said, is whether mental-health issues are a factor. He declined to say whether the man is mentally ill, but said the behavior was related "less to bigotry and more [to] another issue." Passengers said that they have seen SEPTA officers pull the man aside and talk to him after the train arrived at Suburban Station, but that, inevitably, he would return to making rude comments. Spicer's complaint prompted another level of police response. Nestel has intermittently assigned plainclothes officers to observe the man on the train. On one occasion, the chief also assigned two male officers to pose as romantic partners. "That gives us an opportunity to see for ourselves, instead of relying on that rider, or involving the rider in any prosecution or mental-health hearing or whatever comes next," Nestel said. The officers witnessed no erratic acts, he said, but the man still is under occasional observation. SEPTA officers also spoke to the man and his wife, and explained that if the troubling behavior on the train continued, SEPTA police would contact the man's employer. The steps taken are from the playbook the department uses to deal with disruptive riders whose behavior isn't quite criminal. The department doesn't keep specific numbers on how many such incidents arise, Nestel said, but plainclothes officers regularly are assigned to observe disruptive people on SEPTA vehicles, specifically if the department has a picture and the person has regular travel habits. Reaching out to family is also standard. "I'm confident we'll be able to address this without the escalation of the problem or the need for criminal action," Nestel said. Laws make it hard for transit police to take formal action in cases of minor offenses, officials said. For police to issue a citation, Nestel said, it is preferable for an officer to witness the offense. The alternative is to bring a passenger in to testify, something the department rarely pursues. Trying to ban someone from public transit would typically require a finding of criminality and a court order. Even if obtained, officials said, enforcing it over a vast transit network would be hard. So transit police are encouraged to find other solutions. About 30 percent of SEPTA's 250 officers have received Crisis Intervention Team training, which teaches officers how to interact with people suffering from mental illness with as little conflict as possible. The chief expects the entire department to receive CIT training by mid-2016. The search for creative solutions for problem passengers is baked into the department's philosophy, Nestel said. "Our goal in every contact is to de-escalate and not use physical restraint and physical response," he said. The situation facing riders on the Media/Elwyn quiet car, and SEPTA police, is a common one for public transit officials around the country. Police with the Port Authority of New York and New Jersey keep a social worker on staff to help disruptive passengers connect with mental-health services. In Washington, the Metropolitan Area Transit Authority has set up a texting tip line for people who experience harassment on trains, officials said. What is less typical is that SEPTA's offending rider continued his erratic behavior after repeated police run-ins, officials said. NJ Transit police also try to talk to disruptive riders before taking legal action, and usually that alone is effective, said Al Stiehler, the department's deputy chief. "Once we're called, we don't really get very many problems like that," he said. Given the circumstances that Spicer and other passengers report, Pantangelo said, his officers may have charged the problem passenger. "They're not allowed to do that," he said of SEPTA's passenger. "He could be written a summons for harassment." SEPTA officers are continuing to observe the passenger, officials said. Meanwhile, passengers say his disruptive behavior continues. As recently as last week SEPTA police received complaints about the man spitting into his hand before using train door handles, the department confirmed. Spicer has not had any other encounters with the man since the December incident, but she still fears another confrontation. "My stomach clenches a little bit every time I see him," she said. "I hear the words that he said to us over and over again every time I get on the train."